Happy Monday! You want a new Lawnscaping Challenge! Well, its here!! It is all about the numbers game for this challenge!! 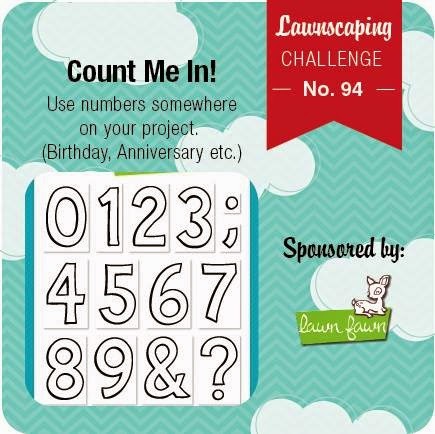 It is about incorporating numbers on your project! For my card, I thought it would be fun to do a different take on a Christmas card. I started by die cutting all of the numbers from the Quinn's 123's dies from white card stock. I, then took my numbers and used R29 Copic Marker to color in the 2 and 5 and the G17 Copic Marker to color the rest of the numbers. I, then die cut a 4 inch white card stock panel and adhered my numbers straight down. Then, I used Violet's ABC's to stamp out 'December' in VersaFine Onyx Black ink ( probably my favorite alpha set from LF) and the "TH" after 25. Then, I stamped the tree from Trim The Tree in Versa Mark onto a piece of vellum card stock and heat embossed it in Gold embossing powder. I didn't want to take away from my numbers back ground, that is why I chose vellum. I fussy cut that out and put little dots of Tombo Mono glue around the embossing on the back so you couldn't be able to see the adhesive. I also wanted a pop of gold on the sides of my panel, so I had some gold WOW paper from American Crafts in my stash and added a thin strip on each side, and then I adhered that to my 4.25 in square white card base. For the finishing touches I added some enamel dots to my tree. I don't want to forget to mention that the ever so awesome Lawn Fawn is our sponsor for this challenge, so if possible I'd play along for your chance to win a $25 gift certificate!! Thanks for stopping in!! See you soon my friendly crafters! What a COOL background!! I love it!! I'm a sucker for anything vellum! And I agree that alpha set is so lovely too!! 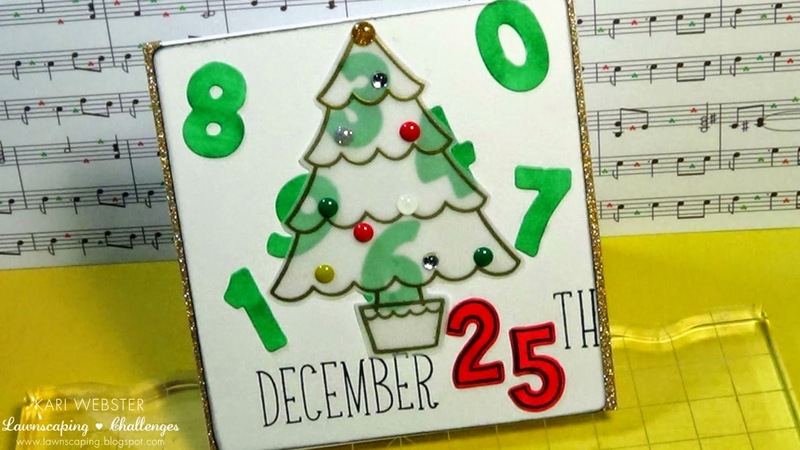 Such a great way to incorporate the numbers! !